So this is Oscar. And what have you done? Speaking for myself, lately, not a hell of a lot. In the three weeks that this column has been on hiatus – apologies to the handful of you who missed it – it’s remarkable how little the O-word has been on my mind. Yes, I’ve been busy: a trip to the Berlinale here, a stretch of scriptwriting there, the occasional interference of an actual personal life in between. But even if I hadn’t been, and even if the estimable Nathaniel Rogers hadn’t borrowed most of my remaining awards-talk energy for his Oscar Symposium, I doubt I would have found much that was fresh or consequential to fill this space. I’m not alone. In an awkwardly scheduled season that saw the most crucial precursors announced before Oscar nomination day, and nary a shift in the frontrunners since, Phase Two of the season has amounted to little more than a month of journalistic thumb-twiddling, while most of the nominees wearily float above it all. Remember when the Oscars took place in late March, or even April? Today’s surfeit of Oscar bloggers would have died in wait. It’s almost enough to make you admire the brazen transparency with which the L.A. Times attempted to drum up drama in the latter stages of voting, rather like a cranky toddler, bored of behaving himself at the supermarket, throwing a tantrum in the checkout line. Almost. Running 11 consecutive anti-“Hurt Locker” pieces in the space of four days is a valiant effort by any measure. But even if the city’s flagship paper thereby appears to be surreptitiously supporting the belief that a win for “Avatar” would be healthier for Hollywood, I can’t help thinking that this mini-assault has been motivated more by boredom than any kind of concern, marking the point where the peculiar monster of awards journalism really begins eating its own tail. Meanwhile, numerous bloggers, equally hungry for content, have only fed the beast by offering their own perspective on the matter. Many are disapproving, but even with the best of intentions, such coverage only adds presence to a mostly synthetic story. I’ve steered clear of the subject, mostly because I find it difficult to write with any conviction about things I don’t believe in. I should be more upset that this is even a remote possibility. For the first time in 20 years of Oscar-watching, my single favorite film of the year (going by the U.S. calendar, at least) is simultaneously the favorite for Best Picture, and I’m eager to know what that win feels like. Should it, and I, be denied, I’ll be briefly sulky, not to mention out a few quid. But I’ll go back to treasuring my favorites just as I did previously. The Oscars make no difference to the way I view and appreciate films. And if they do for you, then you should reconsider what you love about movies in the first place. I like to think the majority of the moviegoing public feels the same way. I expressed as much to Sasha Stone in a friendly Twitter exchange yesterday, when she stated her fear that “The Hurt Locker” would be “ruined” by this negative publicity. To illustrate her point, she described the situation as “‘Slumdog’ redux,” suggesting that last year’s non-controversy over treatment of child actors is a permanent blight on the 2008 Best Picture champ. I disagreed. Such stories are of concern only to those of us who look out for them in the first place; in the real world, Danny Boyle’s film is approximately as well-regarded today as it was prior to last year’s Oscar sweep. And in the real world, many viewers are going to be surprised by victories for “The Hurt Locker” on Sunday night – not because they thought any kind of backlash might be afoot, but more simply because they haven’t yet heard of the film. Things are different in the real world. If this column seems like it’s heading toward one of those snotty “why bother with the Oscars” conclusions, I assure you it isn’t. Whether they’re celebrating films I adore or would gladly pay not to see again, my love for the silly, pretty, occasionally affecting pageantry of the annual show remains steadfast. 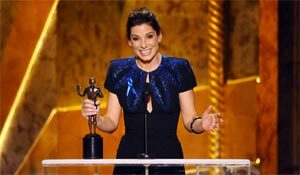 Sunday night, I’ll be holed up in a posh London hotel suite with a few friends and a lot of alcohol, grading the frocks, jeering the dance numbers and (probably) enjoying another lovably goofy acceptance speech by Sandra Bullock. But just as my fandom of American Idol has very little – only Fantasia prevents my use of the word “nothing,” damn her – to do with the contents of my iPod, I watch the Oscars with a different part of my brain to that which watches and values movies. Some of the more malicious mud-slinging from fans in blog comment threads suggests not everyone does the same, but it’s hard to say whether the mischief of journalists who should know better is borne of caring too much or too little about the movies at stake. Happy Oscar night. I hope you have fun. To be fair, Sasha Stone is pretty stupid. I think you may be onto something about the whole boredom thing. Wasn’t it also the LA Times who wrote more than a few negative Slumdog Millionaire articles last year? I can’t remember and if I’m wrong, then I apologize to the LA Times. But if true, then they might be doing this because of how much Slumdog and Locker have dominated the precursors and they were in fact just trying to build-in drama. Still not RIGHT, but at least it’s not some random personal attack on a specific film. Ouch, Rob. I didn’t say it… but I’m not going to say you aren’t on to something. I don’t think Sasha Stone is stupid, but some of her coverage is a little questionable at times. Her partner, Ryan Adams on the other hand, can be a real jerk at times. If you question his approach, he attacks you. If you disagree with his opinion, he attacks you personally. I used to really enjoy awards daily until she brought on that excuse for a blogger. Hurt Locker as the single best film? Wow. I have at least three of the foreign film nominees (El Secreto, White Ribbon and Prophet) ranked above ANY of the domestic films. And, FWIW, I am also in the camp that found Hurt Locker to be highly repetitive, lacking in meaning (other than, perhaps, a general despair over the seeming pointlessness of the military effort in the Middle East) and disjointed in terms of the subplot about the little kid selling DVDs on the military base. I’d rank Hurt Locker quite low if I were filling out a preferential ballot. But I would rank it higher than Blind Side, and Carrie Mulligan would get my vote for Best Actress. I’d rather this didn’t turn into a thread attacking another site. Play nice, guys. Scott: According the U.S. release calendar, I specified. “A Prophet” ranks higher than “The Hurt Locker” for me (see my 10 Best list), but it’s technically a 2010 release there. I do read on The Envelope, if only because I peruse a number of sites, but I can’t argue about the manufactured drama with HL of late. To me, it was worth a few giggles and a brief spell of excitement, and then I moved on. I won’t berate them for it, because it’s not worth it. Without beating a dead horse too much, I found HL a good but forgettable film. If and when it wins, whatever. I won’t be rupturing veins in my forehead like I do some years, but I won’t be pumping my fist, either. I think the broadcast will be a pretty dry night, peppered with a few surprises (hopefully pleasant ones). I was excited for the show, but now I’m just damn tired. Lenny, I haven’t followed Adams a lot but how can you say that for him when Kris does exactly what you described? Especially in the last months. Exhaustion is probably the cause but still, he does it. Guy, nice to know you are screenwriting. That short in imdb, cowritten by you, was interesting. I really liked the last line (I don’t know if it was yours). It felt like a witty reference to the hypocricy of people with power. Great post, Guy. Unlike some of the other commenters, I don’t think Sasha is stupid and I really like her site. I saw your exchange with her yesterday, and I feel exactly the same way you do. I have a friend who is into movies and even loves the Oscars, but she doesn’t follow it all rabidly like I do. The Slumdog thing was not on her radar last year, and she didn’t have a clue about all the Hurt Locker drama until I mentioned it to her. I think it’s really easy to get bogged down in this stuff when you run a site devoted to it and spend months living and breathing it. The perspective of someone in that position is going to be skewed. That, and Sasha really loves The Hurt Locker, so it just might be harder for her to see around all the media attacks coming at the film and realize that the vast majority of people don’t know a thing about it. I hope that when The Hurt Locker wins (and I firmly believe it WILL win), it turns a lot of people’s attention onto this wonderful film. This film has a lot of offer to a mainstream audience, as well as for cinephiles, and there’s no reason it shouldn’t be successful with them. I personally enjoy Sasha’s site and insite as well. Taking unnessary potshots is stupid. I suppose misspelling unnecessary makes me stupid, ha ha. Gah, I thought the picture at the top of the page was from “Lost”. Damn Evangeline Lilly and her worthless cameo! Yes, it was Sight Test. Anyway, I do enjoy Awards Daily and appreciate their coverage, and for all I know, Sasha may be extremely bright — after all, she IS able to cobble words together to make sentences — but her opinions and insight are frequently ill-advised, irrational and occasionally incoherent. Yes, if I accomplish nothing else in life, at least I’ve had a credit on a film with Rita Tushingham. Where on earth did you guys see the film? Jim T, I was just wondering the same thing. Rob, ‘fess up.